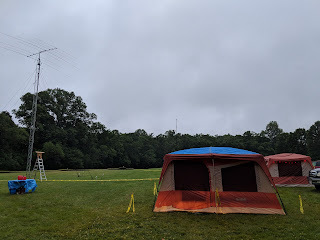 From Saturday June 23 to Sunday June 24, I participated in my very first ARRL Field Day. I also helped set up for an hour on Friday the 22nd. Field Day is best summed up as an emergency preparedness exercise with a contest aspect to promote amateur radio to the general public. I participated in field with my local club, the North Shore Radio Association. It was held at Endicott Park in Danvers, Massachusetts. One of the attendees was Dr. Mark Patterson, WB2OIL from Northeastern University's Global Resilience Institute who was there to interview fellow hams on their opinions on Field Day and how it pertained to emergency response. Despite my limited time of being a ham, I still gave my input. We had a SSB voice station, along with two CW stations and new this year, an FT8 digital station. I only did operating on SSB voice, operating on 80 and 40 meters. I managed about 19 contacts. The club as a whole managed 2852 contacts. I enjoyed Field Day and it's pushing me to get my General license so I can experience the wonders of HF from my own home. Granted I need to set up everything first before I do that. 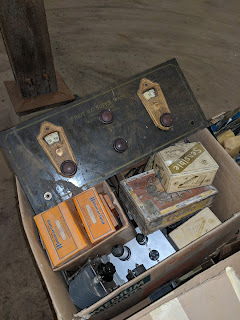 W1OCY, Everett E. Chapman, is a silent key. He died in 2010, just two days shy of the new year at the age of 85. He was born on April 30, 1925 in Glen Cove, NY and grew up in Vermont and New Hampshire. He served his country in the United States Navy during World War II and was part of the V-12 Navy College Training Program at Dartmouth College. He was at least an Ensign based on items we found in this "treasure." I don't know if he reached any higher ranks, I've tried searching through US Navy Registers online and so far, I haven't found anything. He graduated from Dartmouth in 1948 with an A.B. and entered the business world in 1955 working for Dynatrol and other places in the aerospace industry such as Raytheon based on his collection of papers we found. He didn't have much family, didn't marry, at least from what I can tell and obviously no kids. He was survived by brother Donald, who is still alive and will turn 90 on April Fools' Day this year. Yesterday, I participated in the 123rd running of the Boston Marathon. Not as a runner mind you, but as a volunteer; specifically an amateur radio communications volunteer. 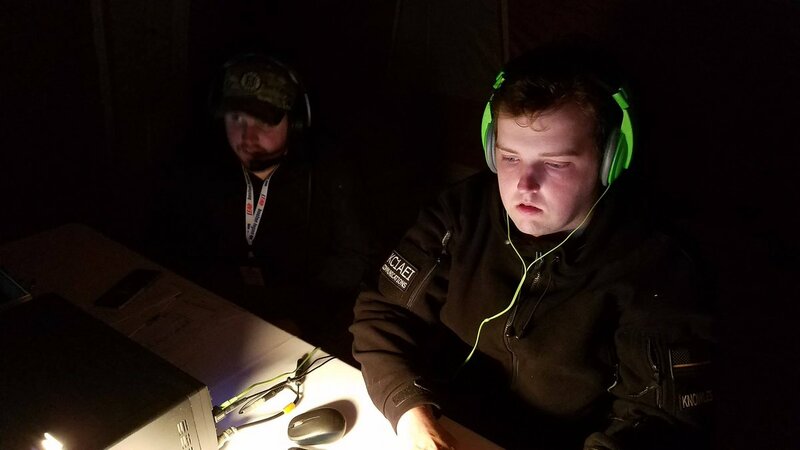 Amateur radio is one of the three radio systems going during the Marathon, operating along aside public safety radios that are interoperable for the event and the commercial DMR radios that the Boston Athletic Association (BAA), the race organizers, have rented for the duration of the event. There are various roles amateurs play at the Marathon and it is divided into four segments, Start, Course, Finish and Transport. Start and Finish work obviously the start and finish line. 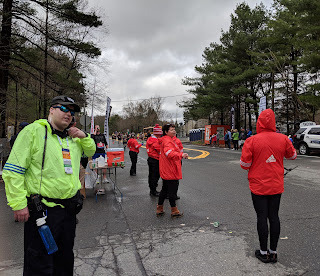 Course, which was the segment I was assigned to, is split among the hydration and medical stations along the course and Transport works the sweep buses to pick up runners who have dropped out. Course and Finish also have Net Control Operation Centers that serve as the focal point of relaying operations for their respective segments. 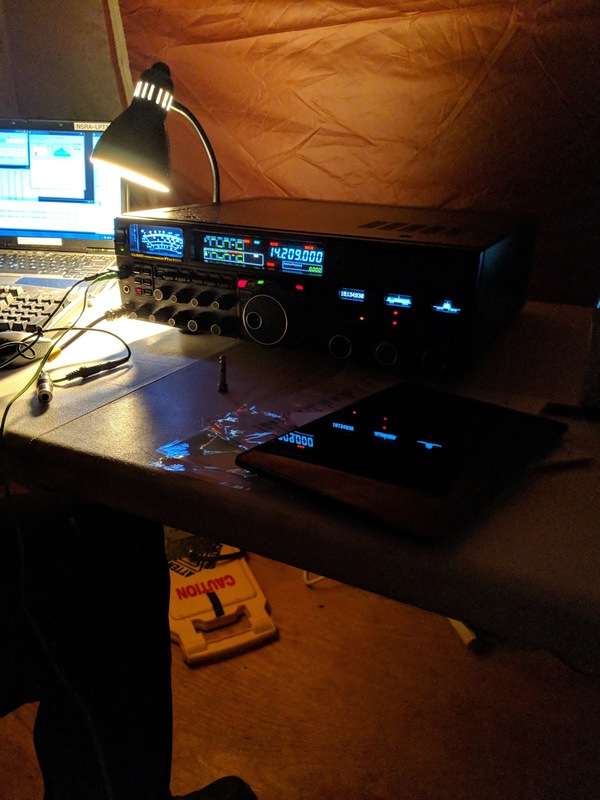 I'm an avgeek, so I recently setup my own Automatic dependent surveillance – broadcast or ASD-B receiver. There are plenty around. The most common setup is to use a Raspberry Pi with a PiAware image on an SD card, an RTL-SDR and a 1090 MHz antenna. 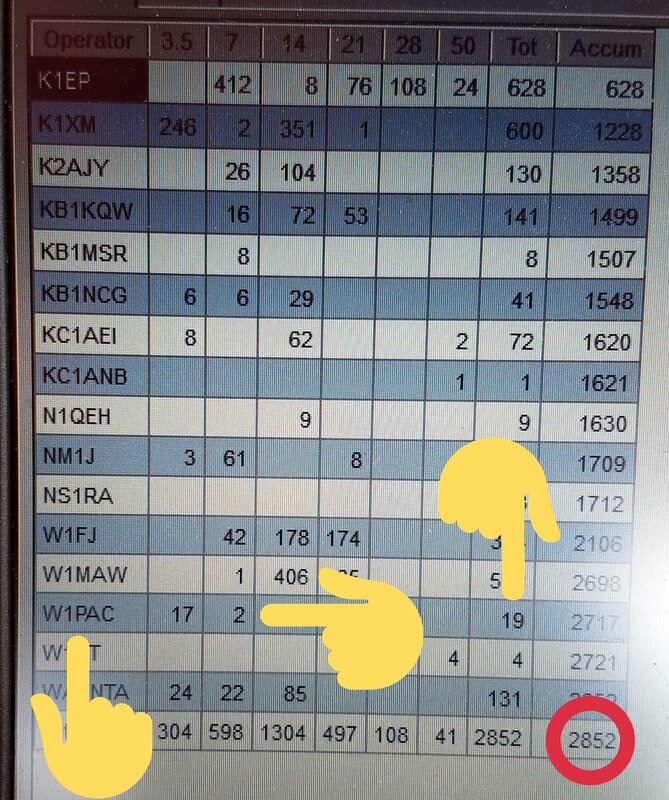 There are also more dedicated setups using hardware provided by the major ADS-B tracking websites such as FlightAware and Flightradar24. I went the Pi route. However, instead of using the FlightAware PiAware image that's commonly available; I choose to run the ADS-B Receiver image by Joe Prochazka. 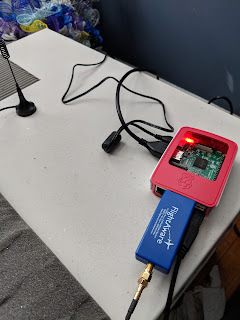 My setup consists of a Raspberry Pi 3B, a FlightAware Pro Stick Plus and a cheap $7 1090 MHz antenna. The Pro Stick Plus is nice because it's essentially a RTL-SDR USB dongle with a built in 1090MHz filter and RF amp. FlightAware also offers the regular Pro Stick which does not include a 1090 MHz filter.